I can't recall with great precision just what I used to dress up as on Halloween when I was a kid. Cowboys and Indians was a favourite neighbourhood game back then so I think I was a cowboy a year or two. I seem to remember having a coonskin hat so Davey Crocket was another costume I donned. And, of course, the old sheet with two holes for my eyes was sure to scare the neighbours, unless the Klan was riding through southwestern Ontario in the 1950s and was giving us kids a one-day only membership special, uniform supplied. As we got older we'd yell really brilliant things at people's doors like "Trick or treat, smell my feet, give me something good to eat". I wonder who made that up? I guess some people didn't hear us because they gave us apples. Apples? There were a lot of squished apples in the road by the end of the evening as I recall. And as we glided into our pre-teen years my buddies and I would stock up on eggs. We didn't give people a choice when it came to trick or treat. Our trick was to hurl those eggs at people's doors and windows and then run like hell. 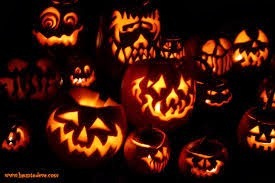 And then before I knew it I had kids of my own and was taking them through the neighbourhood to trick and treat. One year in particular still sticks in my mind. The boys wanted me to make them a costume. After I thought about it I thought I'd dress them up as space aliens. So I took some cardboard boxes - large ones for the body and smaller ones for the head. I covered the smaller ones in tin foil and spray painted the larger boxes a nice alien lime green. And then I made and pasted appropriate alien doo-dads on the front of the boxes. The boys were thrilled. And I was so pleased that they liked them. So after dinner off we went. Up to the first house they marched. They rang the bell and shouted "trick or treat" when our neighbour answered. He looked at the boys and said "Now there's a unique costume, fellas." My chest swelled with pride. and he looked at me and said "I don't think I've ever seen furnaces before." Needless to say the boys weren't too happy after that. They thought they were aliens. And that was the last year I had a hand in making any costumes. 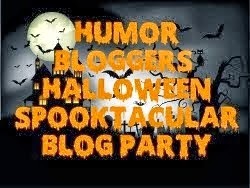 This post was my contribution to the Humor Bloggers Halloween Spooktacular Blog Party. It runs from October 21 to November 1 and you can take a look at what other bloggers have written by visiting Humor Blogger Dot Com. Tell them dufus sent ya. Hee Hee. 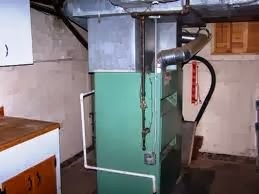 Furnaces. I don't remember much about my costumes, either, but I remember my friend and dressing up as a street people (hobos). Now I'm thinking why in the world did I think that was funny? I'm of an age where I used the term "hobos" or "tramps". Today they call them homeless and I don't think anyone dresses up as them. You? You egged houses? Wow, who would have thunk it? Ha ha ha! You even the sensitive subject of the Klan humorous! I can imagine you as a kid in the fifties. We thought it was pretty funny. We really cracked ourselves up. It was a whole different time, wasn't it? I have lots of great memories. Well, some. I laughed out loud at this one, Dufus! Furnaces, hey? Alex made my grandson, Cyrus, a bumble bee costume one year. He had a back pack with a little generator in it that actually flapped his wings. Poor kid was about 2 years old and the noise scared the hell out of him and made him cry. Still, Alex gets an "E" for effort! That's hysterical! But what a great dad to have given it the ol' college try. I bet you have some great memories. I know I do. Yeah, the ones my mind can recall. Wow, kudos to Alex. That's way above a furnace, er, ah, an alien. Yeah. Afraid it was the last ol' college try. But it was a memorable halloween. And it wasn't the only neighbour to make that remark, which made it even worse. Go on make fun of me. You're just full of hot air.